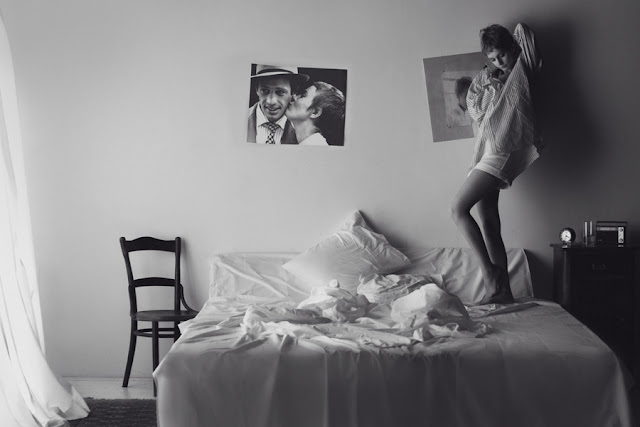 Martyna Galla's photograph set called "La Petite Americaine" were breathtaking, which is fitting because these were inspired by the film "Breathless" (A Bout de Souffle). I've never seen this film but I absolutely love this shoot, the body language between the two models is perfection. I always love the coloring of Galla's photographs but the black and white shots that she does are by far my favorite. Such cute and romantic shots! oh I die these are too perfect! such fun and playful images! i hope you had a wonderful weekend! I've never seen this movie either! I agree, these shots are absolutely fantastic! Beautiful stills. Love the black and white. This shoot really is beautiful!! :] Thanks for sharing! I need to rent 'A Bout de Souffle' immediately - I've seen so many references to it of late. You're right. These are amazing. These photos are so lovely! And they make me incredibly jealous. So so adorable. Those pics are amazing!!! Thanks for sharing this!! Amazing photos, I love pictures if black and white it gives off such a cozy vintage vibe! Thanks for sharing. I love these photos. It's so romantic. what darling photos! I'm in love!